For more information on using the netsh interface ipv6 context, type netsh interface ipv6 /? at a command prompt. 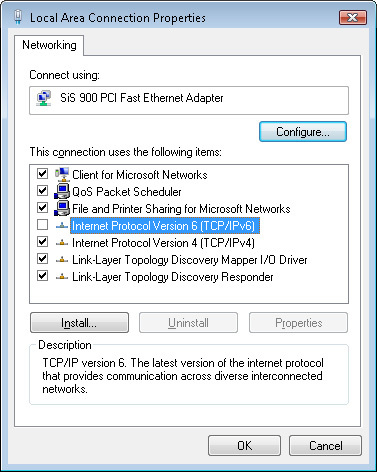 The following section describes some additional IPv6 configuration tasks that network administrators may need to know how to perform with Windows Vista computers. Open the Network And Sharing Center in Control Panel. Click Manage Network Connections, and then double-click the connection you want to configure. Clear the checkbox labeled Internet Protocol Version 6 (TCP/IPv6), and then click OK (see Figure 2). Figure 2. Disabling IPv6 for a network connection. If you disable IPv6 on all your network connections using the user interface method as described in the preceding steps, IPv6 still remains enabled on all tunnel interfaces and on the loopback interface. 5 Modifies the default prefix policy table to prefer IPv4 over IPv6 when attempting connections. For example, by setting the value of DisabledComponents to 0xFF, you can simultaneously disable IPv6 on all your network connections and tunnel interfaces. If you do this, IPv6 still remains enabled on the loopback interface, however. Disabling random interface IDs causes link-local addresses to revert to using 48-bit MAC-layer (or 64-bit EUI) addresses for generating the interface ID portion of the address. In Windows, this happens immediately and does not require a reboot. You must reboot the computer for this command to take effect. If your command output doesn’t contain all of the preceding information, you probably started your command prompt session using standard credentials instead of administrator credentials. Comparing these two command outputs shows that starting an application that uses Teredo changes the Teredo client state from dormant (inactive) to qualified (active). The output of the netsh interface teredo show state command also tells you the type of NAT your computer is behind (if any). In the preceding example, the computer is behind a restricted NAT. Teredo works well behind restricted and cone NATs, but not behind symmetric NATs. If you plan to purchase a SOHO router for broadband Internet connectivity, the best choice is a router that supports 6to4.